Dubai-based Gulf Navigation Holding has reported a loss of Dh14.761 million ($4.01 million) for the first half of 2018, compared to profits of Dh19.029 million ($5.18 million) during the same period last year. The company said that these results will have no effect on the next quarters of the year and one of the main reasons behind these results is the final settlement of the company’s legal dispute with a Chinese company that was due since the time of the previous administration, said a statement from the company. Gulf Navigation settled the case by paying $8 million against the $19 million that was due. The company also entered two petrochemical tankers into the dry dock for the mandatory five-year maintenance. This included major upgrades to the two carriers in order to enhance the company's competitiveness in the global markets, it said. This is done by adopting plans and programmes to fully comply with international environmental laws related to reducing greenhouse gas emissions, climate change and the targets for 2020, 2025 and 2030. This also helps the group’s short and long-term plans to reduce the environmental footprint of its maritime fleet and trans-sea operations. The upgrade will equip the two vessels with state-of-the-art technologies that will reduce operational expenses, it added. As a result of these expenses and the loss of the two ships’ rental revenues during the maintenance period, the company’s financial results in the second quarter have shown these losses, said a statement. “We managed to reach a settlement to reduce the claim to $8 million. This has permanently closed the disputes and claims incurred by the company in the pre-restructuring and management change phase,” he said. “We have also eliminated the burden of these claims and debts that have depleted the company's resources to pay interest and other legal costs,” he added. “We have installed gas exhaust pumps to reduce sulphur emissions and added advanced equipment to treat ballast water to prevent biological pollution. This will help our vessels comply with IMO's standards and give us an advantage to get new contracts in established markets such as the European Union and North America,” he said. “Many companies are expected to withdraw from these markets because they will not afford the expenses to comply with the new technical specifications. We have also installed new advanced engine fans that reduce fuel consumption by 5 per cent. Taking this step now helps us avoid having to use higher-priced, less-available low-sulphur fuels and thus risking higher operating costs and the possibility of our vessels to stop and not generate revenues while waiting for fuel,” he added. It is a common practice in the maritime shipping sector that ships go through a mandatory comprehensive maintenance every five years. Ships stop in the dry dock for a minimum of two months without making any revenues. 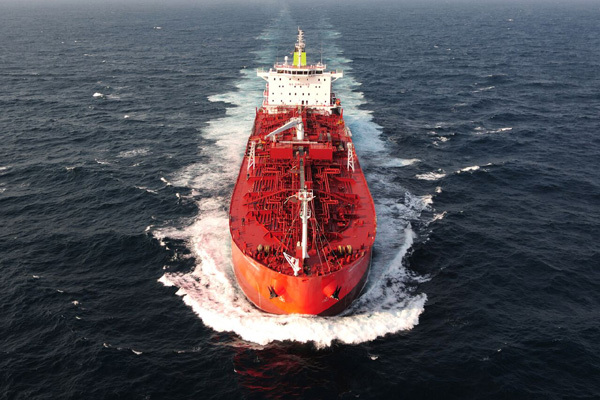 Gulf Navigation has utilised the stoppage period to upgrade its fleet and enhance the capabilities of its vessels with new features that increase operational efficiency by reducing fuel consumption over the next five years. This will also help the vessels meet the new environmental standards for gas emissions and ballast water treatment, ensuring their competitiveness and preference to operate in established markets such as the European Union and North America, thereby achieving significantly higher returns than before, as well as increasing the operational lifespan of ships and raising their return on investment. Gulf Navigation’s technical team of experts adopted these major upgrades and changes for the company’s fleet after an in-depth study of the global petrochemicals and petroleum products shipping industry, in light of the new requirements and standards imposed by the International Maritime Organization, the European Union, and the US. The new measures will force many companies to exit the market because of their inability to keep up with them. It is also expected that low-sulphur fuels will be more expensive and less available. Buamim explained that choosing this particular time for the upgrade has two advantages for the company; the first is increasing the return on investment allocated to owning the vessels by increasing their operating lifespan through the comprehensive maintenance. The second benefit is to get long-term contracts from leading producers of petrochemical derivatives, which will look for environmentally-friendly ships that will not be banned from entering the markets that are bound by the new standards. Reducing the fuel consumption of Gulf Navigation's vessels adds a competitive advantage that allows it to achieve higher profits and offer better prices than its competitors who will pay more for low-sulphur fuel, it said.